The view northwest from S.W. 14th Avenue and Hop Street Monday afternoon. 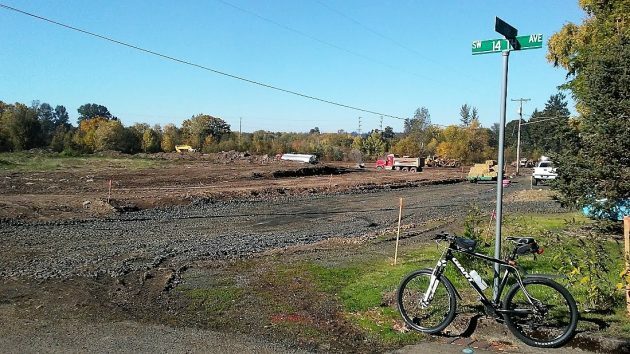 Part of the open countryside at the western end of Albany’s 13th Avenue has been torn up for the construction of a subdivision of 32 single-family residential lots. The construction is taking place in an out-of-the way corner near the western city limits. I didn’t learn of it until after I asked why 13th Avenue west of Broadway suddenly acquired an asphalt overlay a few weeks ago. It turns out that a two-inch layer of new asphalt on 13th, to be installed by the developer, was required as a condition of approval of the subdivision at the street’s western end. Thirteenth is to be the main traffic route to the new area once the houses are built. The city also required that all construction traffic use 13th Avenue to reach the site. Another condition was that two speed bumps be installed on the street. I saw those bumps Monday but, moseying along on the bike, there was no need to slow down. The Albany Planning commission approved the subdivision on 15.3 acres in July 2010. The property was owned by Byron Hendricks of Salem. Subdivision approvals are good for five years. The Salem engineering firm handling the project, Multi/Tech, asked for and received a two-year extension in April 2015 and another one this year. The tentative plat approved by the city called for 9.3 acres of the 15-acre site to be saved as open space. The rest was to be divided into 32 lots in what the city calls a cluster development. This type of development allows some flexibility on items such as lot size or setbacks in order to preserve open space. The development is in the lowlands near the Calapooia River. The planning commission specified that all streets would have to have a crown elevation no lower than one foot below the elevation of a 100-year flood. Boy won’t they be surprised when that 100-year flood level becomes moot – climate change and all?!?! Build house on stilts and get a rowboat. Now you’re ready for the thousand-year flood coming in a couple years. If we didn’t have the perverse National Flood Insurance Program, that’s what more people would be doing instead of endlessly rebuilding the wrong houses. So the land owner owns 15 acres but the city is requiring 9 acres to be open space. That’s more like the city owns the land since they dictate what can be done if you want to develop it. There’s the story. You may want to do your finger wagging at mother nature since the undeveloped land is by the railroad tracks where it appears to be in the floodplain. Fifty years ago this plot of land was used for growing green beans, on a pole mind you, that many Albany youth and adults worked to earn money, me, for school clothes. I could ride my bike down 13th, make my way under the railroad trestle, and get picking! This is the field that we lost Johnny Prince, who’s irrigation pipe touched a power line in the early 60’s. The way Albany is growing, I think these parcels will sell, but you have the railroad going through there every night and you just feel like you’re in a hole. I’m all for making a neighborhood better, good luck with this project. …in addition to the railroad rumblin’, there appears to be only one way in / one way out. Say who is the builder? More zero lot line homes no doubt. One used to need a lawn mower. Thanks for the history Brian. I appreciate it. As one who moved pipe in the 70’s, picked strawberries (but not green beans), I understand. A glass to Johnny Prince then! I never knew him, but am glad he is remembered 50 years later by you. You are very welcome Shawn. Thinking about him now, I may have gotten his first name wrong, I’m not sure! I’m thinking it is Alan Prince, not John or Johnny. His family ended up moving near us south of Liberty School, his sister Jackie was a year younger than I. Anyway, it’s nice to have Hasso finding these gems in his travels!